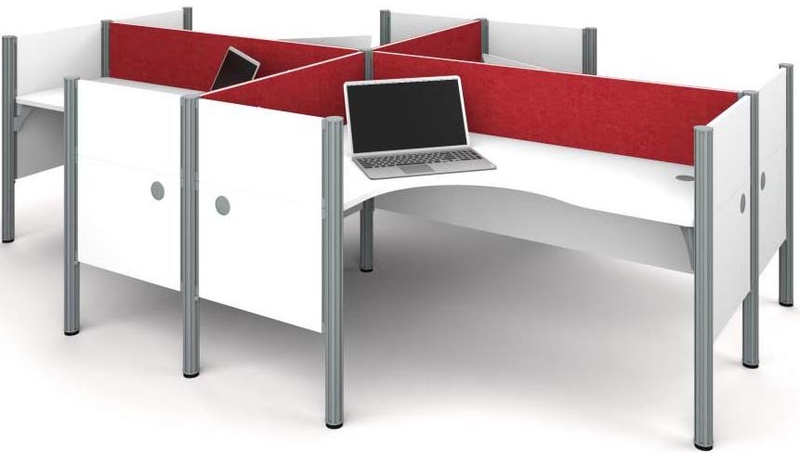 Give your office a clean, contemporary look with white office cubicles! 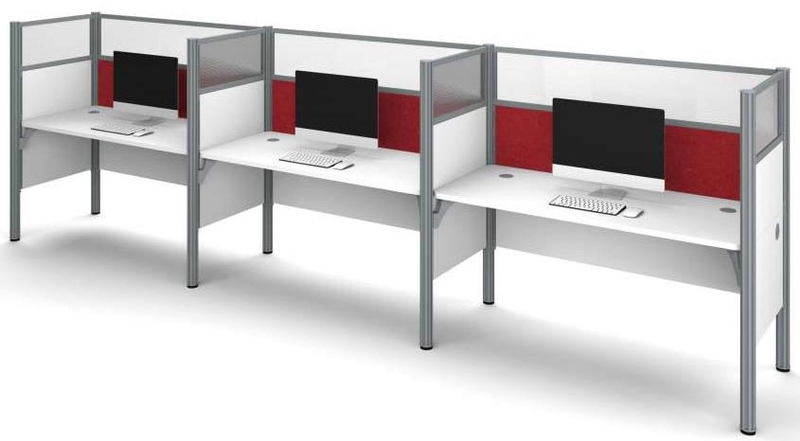 Beautifully accented with your choice of red or gray tackboards, these workstations are a far cry from those drab fabric office panel workstations from years ago. 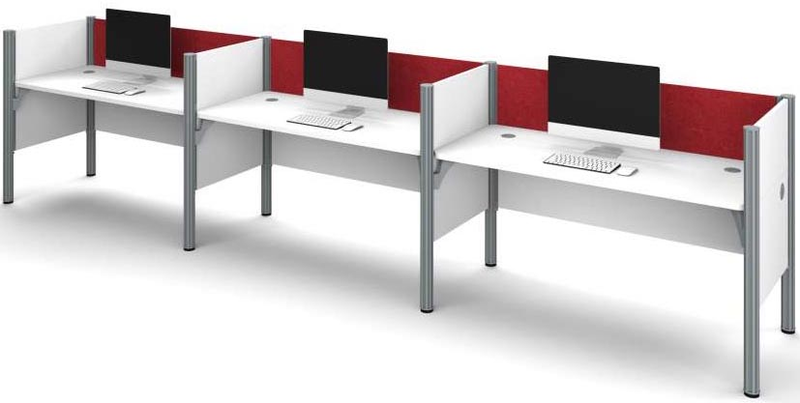 Choose from workstations with and without acrylic glass windows in several configurations! Technology-friendly design allows easy routing of cords and cables. Durable laminate construction ensures years of good looks and dependability. 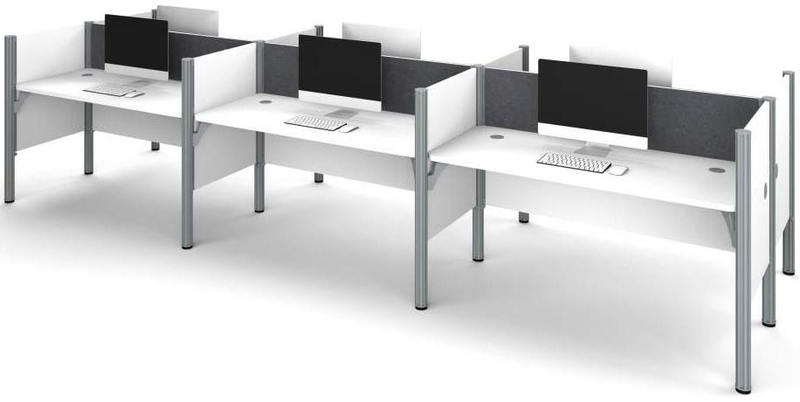 White 4-Person Cluster Cubicle Workstation w/ Windows sold above. See other configurations sold below. 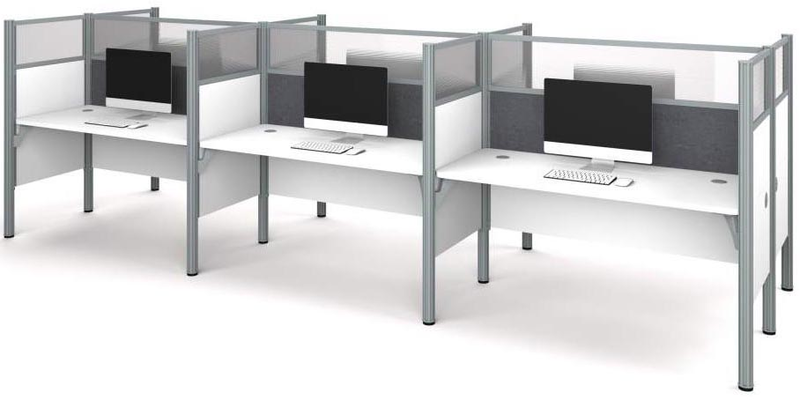 White 4-Person Cluster Cubicle Workstation w/ Windows includes four tackboards and features 55-1/2"H panels with acrylic glass windows. Each desktop includes two grommets for easy routing of cords and wires to floor or wall outlets. End panels of workstation also include grommets. 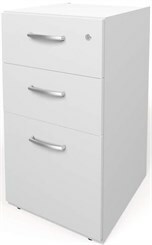 Measures 146"W x 100-1/8"D x 55-1/2"H overall. Ships unassembled. Shpg. wt. 998 lbs. PRICE INCLUDES SHIPPING! (Truck shipment - See Terms & Conditions). Please allow 2 weeks for delivery. * Crisp white melamine laminate is scratch-resistant. 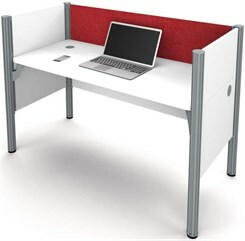 * Desktop edges are finished in a matching white PVC band edge. * Sturdy silver cubicle frame. 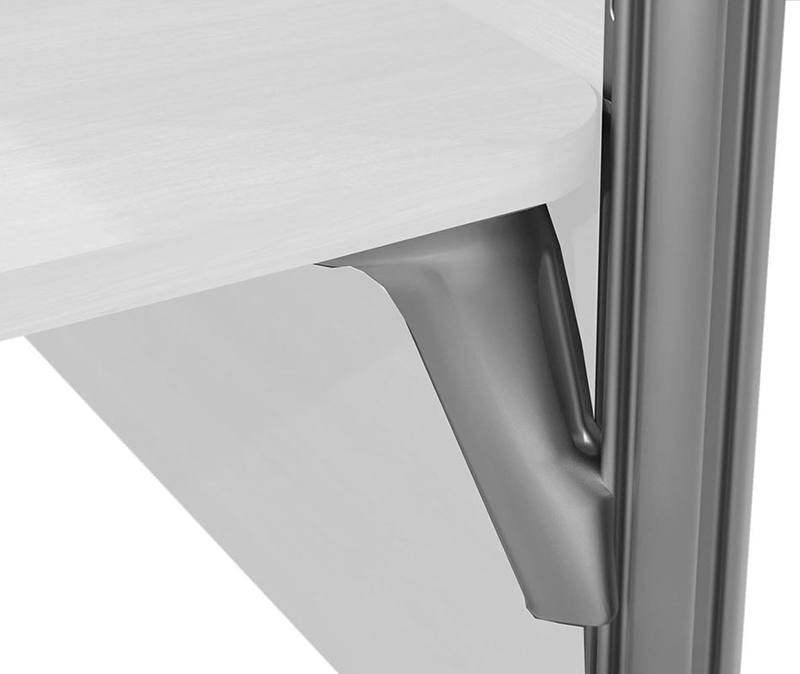 * Efficient wire management with grommets and under-desk eyelets. * Choose from a eye-catching Red or classic Gray tackboards. * Acrylic glass windows are shatter-resistant. * Workstations are finished on all sides. * Packaging made from 100% recyclable material. * Four way I-Beam aluminum post for quick and easy installation with slide lock assembly. * Meets or exceeds furniture industry (ANSI / BIFMA) performance standards. 1 - 2 $3,599.00 ea. 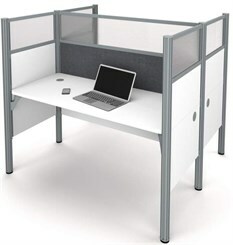 Just like the workstation sold above but with 43"H partitions without windows for collaborative settings. Measures 146"W x 100-1/8"D x 43"H overall. Ships unassembled. Shpg. wt. 972 lbs. PRICE INCLUDES SHIPPING! (Truck shipment - See Terms & Conditions). 1 - 2 $4,599.00 ea. 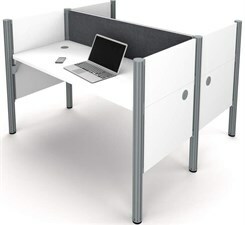 Double sided workstation fits 3 people per side. Includes 55-1/2"H windowed partitions for privacy. Two grommets per desktop and grommets on the end panels of the workstation for easy routing of cords and wires to floor or wall outlets. Measures 182-1/4"W x 56-1/8"D x 55-1/2"H overall. Ships unassembled. Shpg. wt. 914 lbs. PRICE INCLUDES SHIPPING! (Truck shipment - See Terms & Conditions). 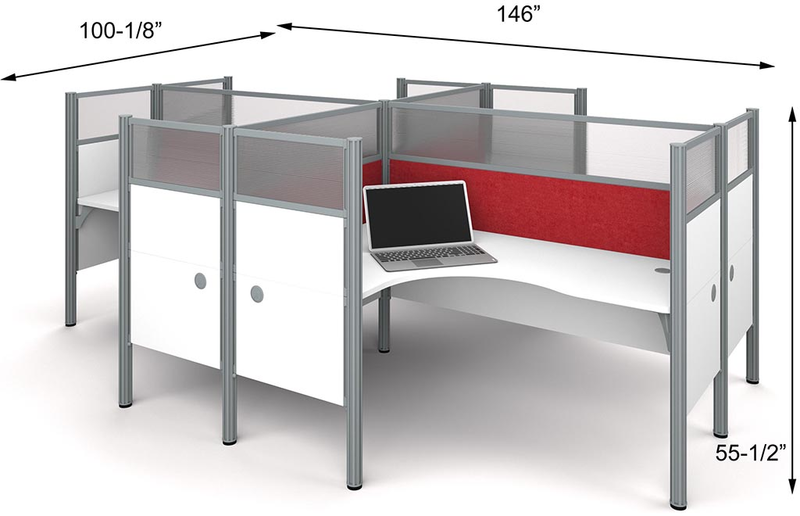 Just like the 6-person workstation sold above but with 43"H partitions without windows for collaborative settings. Measures 182-1/4"W x 56-1/8"D x 43"H overall. Ships unassembled. Shpg. wt. 790 lbs. PRICE INCLUDES SHIPPING! (Truck shipment - See Terms & Conditions). Just like the Y11012 workstation but single sided, to outfit 3 people. 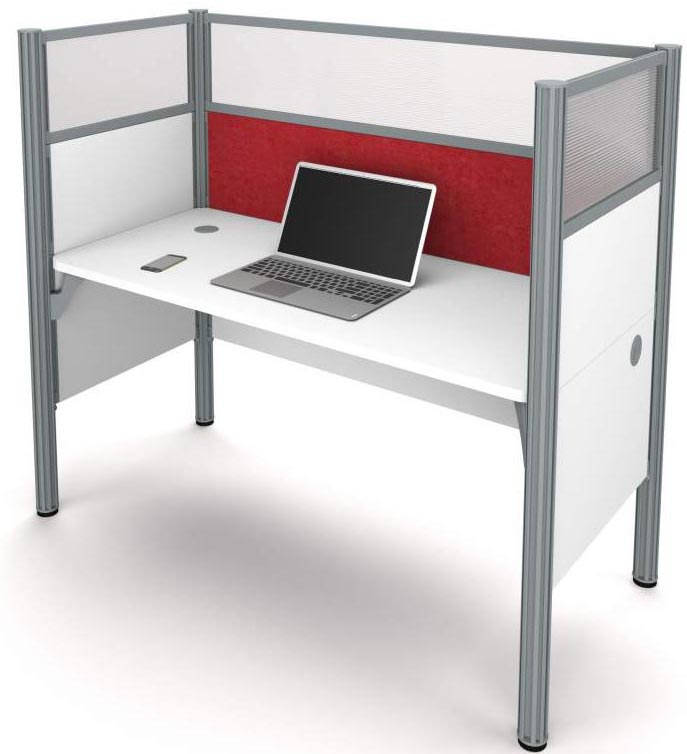 Includes 55-1/2�H windowed partitions for privacy. Measures 182-1/4"W x 29-3/8"D x 55-1/2"H overall. Ships unassembled. Shpg. wt. 708 lbs. PRICE INCLUDES SHIPPING! (Truck shipment - See Terms & Conditions). 1 - 2 $2,399.00 ea. 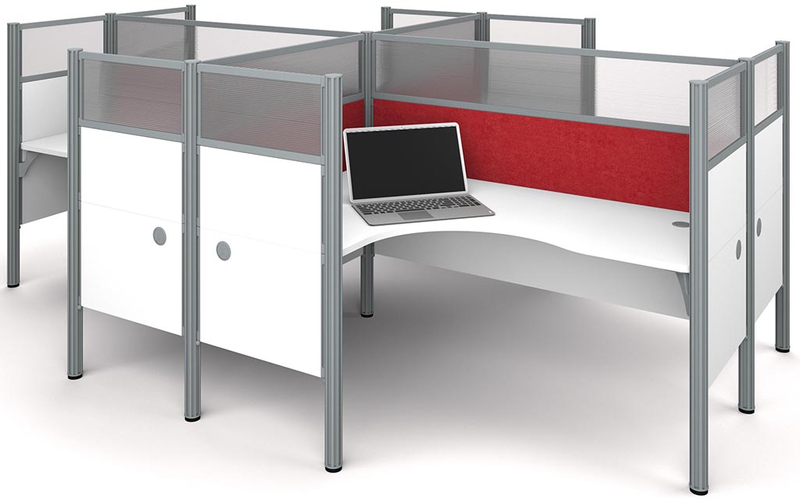 Just like the 3-person workstation sold above but with 43"H partitions without windows for collaborative settings. 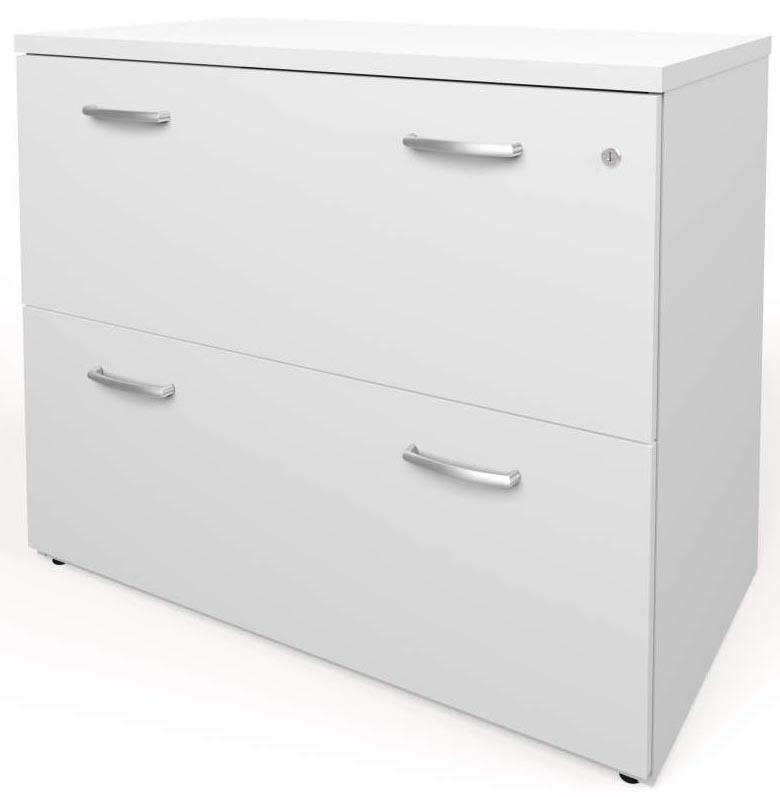 Measures 182-1/4"W x 29-3/8"D x 43"H overall. Ships unassembled. Shpg. wt. 648 lbs. PRICE INCLUDES SHIPPING! (Truck shipment - See Terms & Conditions). 1 - 2 $2,049.00 ea. 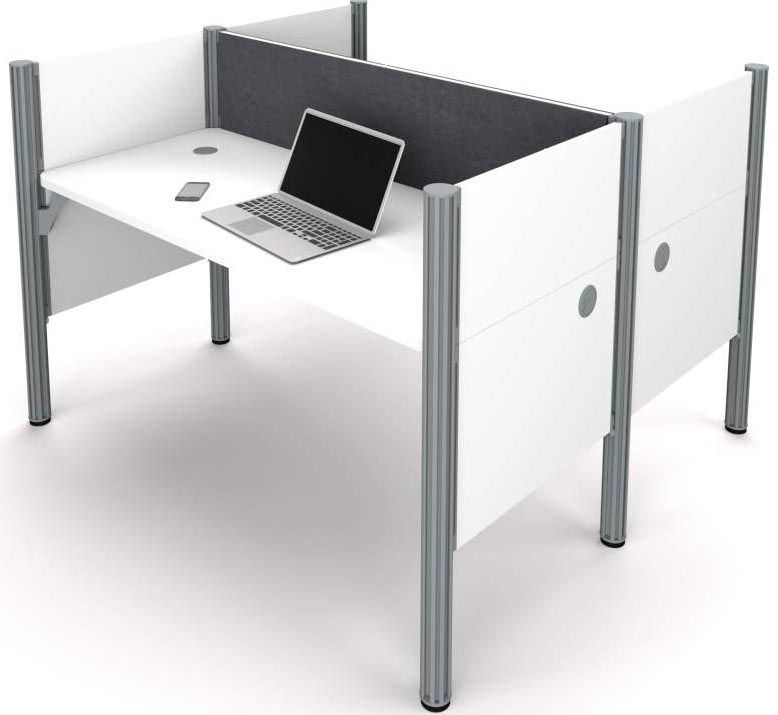 Just like the 2-person workstation sold above but with 43"H partitions without windows for collaborative settings. Measures 62-1/2"W x 56-1/8"D x 43"H overall. Ships unassembled. Shpg. wt. 439 lbs. PRICE INCLUDES SHIPPING! (Truck shipment - See Terms & Conditions). 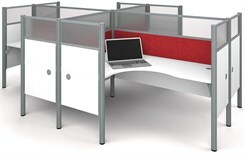 Includes 55-1/2�H windowed partitions for privacy. Measures 62-1/2�W x 29-3/8"D x 55-1/2"H overall. Ships unassembled. Shpg. wt. 369 lbs. PRICE INCLUDES SHIPPING! (Truck shipment - See Terms & Conditions). 1 - 2 $949.00 ea. 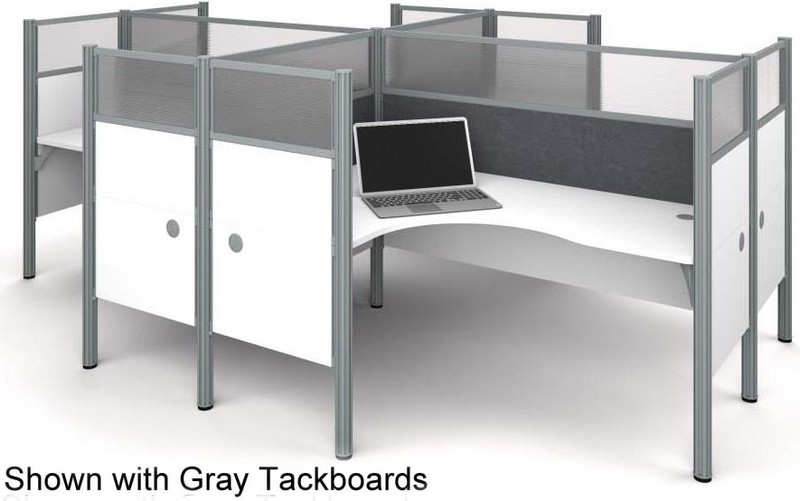 Just like the workstation sold above but with 43"H partitions without windows for collaborative settings. Measures 62-1/2"W x 56-1/8"D x 43"H overall. Ships unassembled. Shpg. wt. 343 lbs. PRICE INCLUDES SHIPPING! (Truck shipment - See Terms & Conditions). Attach slide out keyboard tray to any workstation above. Full extension ball-bearing slides for smooth and quiet operation. Measures 26-3/8"W x 14-5/8"D x 2-3/4"H overall. Shpg. wt. 17 lbs. PRICE INCLUDES SHIPPING! (Truck shipment - See Terms & Conditions). Ships fully assembled! Finished on all sides. Full extension ball-bearing slides for smooth and quiet operation. Lock included. Measures 36-1/2"W x 19-1/2"D x 20-7/8"H overall. Shpg. wt. 145 lbs. PRICE INCLUDES SHIPPING! (Truck shipment - See Terms & Conditions). Ships fully assembled! Finished on all sides. 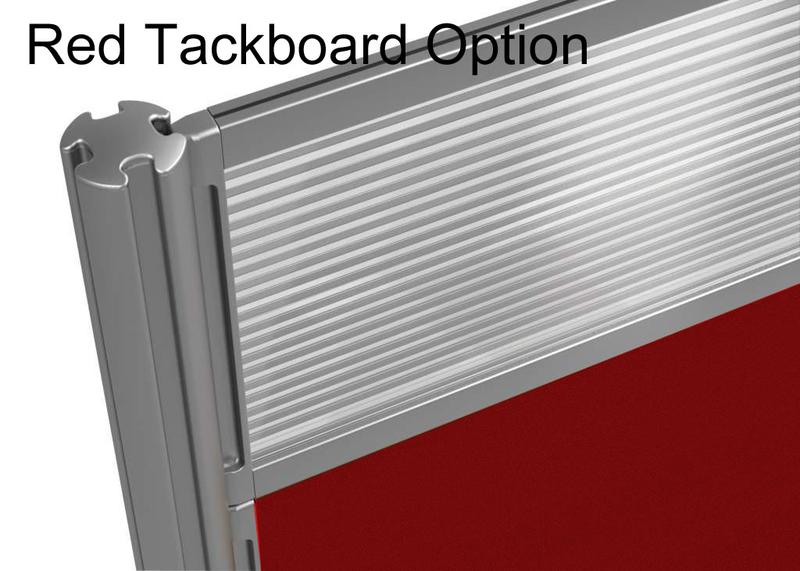 Full extension ball-bearing slides for smooth and quiet operation. 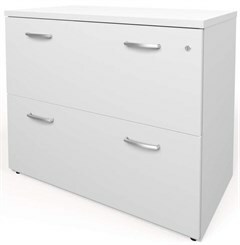 One lock secures top two box drawers and bottom hanging file drawer. Measures 15-3/8"W x 17-5/8"D x 28-7/8"H overall. Shpg. wt. 59 lbs. PRICE INCLUDES SHIPPING! (Truck shipment - See Terms & Conditions).